For what it is, I give this game an 8/10. It’s fast paced and easy to learn. It’s Scrabble’s cool uncle. If you’re into word games or games that play fast or games that allow you to chat over friendly competition, I think that this game meets those needs. Asking your neighbors how to spell words or if a certain combination of letters makes a word can lead to some jokes. It’s fun to banter with everyone and complain how bad your letters are, only to pull off a stroke of creative genius by diving deep into your word bank. For a fast paced game, those who may not be able to work as quickly can still enjoy it, because the point isn’t to make as many words as possible – the point is to use all of your letters to make words. So you could actually not say “peel” the whole game but still use your last letter to make a word that will win the game. Momentum can swing quickly! And if you don’t have good letters, it’ll be over soon. You can play the game in 10 minutes. This is a good game for families and casual gamers and for some social gamers. Those who are into heavier games with loads of strategy will be probably be bored with this game. Like I said, for what it is, it’s a very good game…you probably play it 10 times in the amount of time it takes to play a game of Scrabble – and you don’t need to do any math or calculate those triple word/letter scores either. Who wants to do math when you’re spelling? I purchased this game for two reasons. – It’s very portable and durable, so it’s great to take on trips. – I had read several times that this game is great for people who love Scrabble and people who hate Scrabble. I don’t care for Scrabble (I’m too impatient), but my parents love Scrabble, so this is something I might be able to get them to play with me instead. Someone yells “split”, everyone flips over their tiles, and start making words. The words all have to connect to one another like in Scrabble or a crossword, and you only play with your own set of tiles. Whenever someone uses up all their tiles, they yell “peel” and everyone takes another tile. This continues until there are not enough tiles left in the pile for everyone to draw another tile. Then the first person to use all their tiles yells “bananas”. If all their words are valid, they win. You can rearrange your tiles as much as you want. If you have a tile you just can’t seem to fit in anywhere, just yell “dump”, put that tile back in the pile, and draw three new tiles. I bought the 2012 Olympics version (it was cheaper at the time), and it comes with 5 “blank” tiles (they each have a picture of an Olympic sport on them- swimming, running, etc.) which can be substituted for any letter you choose. I can see how this would be appealing to those who love Scrabble. You’re still fitting words together, but you just do it with your own set of tiles. Avid Scrabble players can have an advantage, because they may know more words, especially the more obscure q and vowel only words. On the other hand, they could have a disadvantage too if they spend too much time thinking about which words to play. In Bananagrams, the complexity of the word doesn’t matter, you just need to make them as fast as you can! Overall this isn’t my favorite game. I still find it a bit too dull for me. I’d rather play something more interactive. With more people, it may be more fun though since I’ve only played with 2 and 3 person games. If you like Scrabble or word games in general, this is probably a really good option for you. Bananagrams is a real-time game of crossword creation. Players all play simultaneously, trying to use up all their letter tiles by placing them so that all their tiles are touching in a continuous crossword, and all the connections make legitimate words. Once a player has used all their tiles, they shout “PEEL!” and everyone takes another tile from the face-down supply. 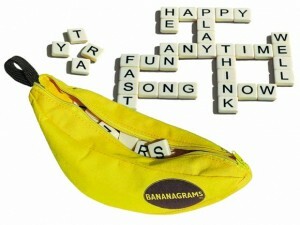 Once the supply is empty the first person to use all their tiles says “BANANAGRAMS!” and is the winner! The game is a race; there are no points to be added up, and spelling a particularly impressive words has no strategic benefit, although it’s fun to see the unique words everyone is able to create. Rounds are fast, lasting about 5-10 minutes at the most, and taking even less time with more players (since the tile pool doesn’t last as long). It’s very accessible and easy to learn, and plays a lot of people at once. The components are well made, and the tiles have a good feel to them. The tiles seem to be a high quality plastic and hold up well to being dropped and to liquid spills. This is a good game to take to a restaurant or bar, as you can play several times waiting for food, on almost any surface, and it fits easily into a handbag. The banana-bag is pretty fun, too, and has held up to being carried around all over the place. People who are not into boardgames (yet) tend to enjoy this game more than they initially expect because it’s fast and fairly non-committal. If someone is intimidated and doesn’t want to play, they usually join in by the second round. This makes it a great gateway game to bring to a non-gamer’s house, or out and about. That said, boardgamers will probably find the excitement of Bananagrams fades quickly. The fast pace is exhilarating at first, but after a few rounds it becomes tiring (especially if the same player continually wins). There’s no real in-depth strategy beyond playing as fast as possible. This is a good appetizer to a more serious game, or one to play while waiting for the rest of the group to show up. All in all, a great value! This game is great for a quick play (10-20 minutes depending on your skill) that is different every time based on the letter tiles that you draw. Form your own “Scrabble” board in a race against your opponent. Every new word must connect with a previous word, so you must choose whether to go for the simple words for time or figure out longer words to give you more options later. My wife and I enjoy playing together after a meal. If you like word games, this is definitely for you! This is one fast paced word game. Like Scrabble without the board, the extra point spaces and the long pondering. Make words with your chits as fast as possible because your opponents are doing the same against you! If you are good at word games like Scrabble and Boggle then this one MIGHT be for you. It all depends on how you handle stress. I usually do well at Scrabble but I end up getting my head handed to me when I play Bananagrams every time. I just seem to draw all the useless tiles when I don’t need them, or 5 E’s when I do need the obscure ones. At any rate it is a fun, fast paced game that can easily be played 5 or 10 times in one sitting. Ideal for family game night or to get some game on in between time slots at conventions. And it is easily one of the most portable games I have seen. The whole thing fits in your pocket, so you can take it anywhere. Bananagrams is a very fast-paced, Scrabble-ish type game. It can be frustrating when someone continuously runs out of tiles and yells out, “PEEL!” but that’s part of the fast-paced fun. I’d say this game is best for a group of 4-5, any less or more and it loses fun and becomes either more boring (if the group is too small) or more frustrating (if the group is too big). At first the fast-paced nature of the game threw me off and I felt like I would never catch up with anyone else, but I got into a groove and found myself quite enjoying scrambling to make words! I’m an engineer and terrible at spelling/thinking of words, this game is absolutely frustrating for me. That being said, I love this game. It really stretches me and helps me think in ways I have not had a chance to in many years. The rules are very easy to pick up and is very accessible for all levels of players. When we have people over for a casual gaming night, this is always a game we reach for and is always something that turns out to be a fun time. I will say that the game is a lot more interesting when everyone is the same skill level when it comes to making different words. We played with a friend who is an english teacher/scrabble enthusiast and it was over far too quickly. Other than that, I would say the only other thing I would say is for avid gamers is to focus on having fun and then winning. This is a really simple, incredibly quick word game that plays with a large number of people. You have a limited set of letters and must build off words played by others using your letters, or you can draw new letters. The game ends when a player uses all of their letters and if you’re playing with 6 or more people, the game can end in seconds. It’s a bit stressful and a bit too short to really be something I want to pull out often. I’d rather play Scrabble (which takes forever, I know) or Boggle, which is quick, but doesn’t feel as frantic. This is a neat game and worth the price, just not a favorite of mine. This is a good game for family or casual gamers. The goal is to form words given random tiles in a “Scrabble” like manner with the first to use all of his/her tiles winning. It is a simple game that can be played within minutes of picking it up and is great for younger audiences. This is a great starter or filler game as it takes little time to pull out and play several times. If you are looking for a quick, fun, and simple game for little cost I would recommend giving it a try. Pros: Quick to set up quick to play, easy to learn, simple. Cons: Simplicity won’t satisfy avid gamers. 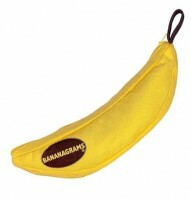 Add a Review for "Bananagrams"